Probably set in the 1970s when stand-up was in its infancy and dodgy jokes the norm, this play tells the story of a broken man. Freddie Tourrino is a journeyman – a man who travels from place to place to entertain with storytelling, magic, clowning, drama and music in a vaudeville tradition. Born to it like his father and grandfather before him, he meets his soul mate in the Donegal countryside and steals her away on a motorbike to an itinerant’s life in England. His life with Grainne is hard but fulfilling – perhaps in spite of his trade he is an artist as well as an entertainer – and the couple have a perfect son, Joseph. A tragic accident shatters the couple’s lives when Joseph is killed during the Great Tourrinos’ act on stage. 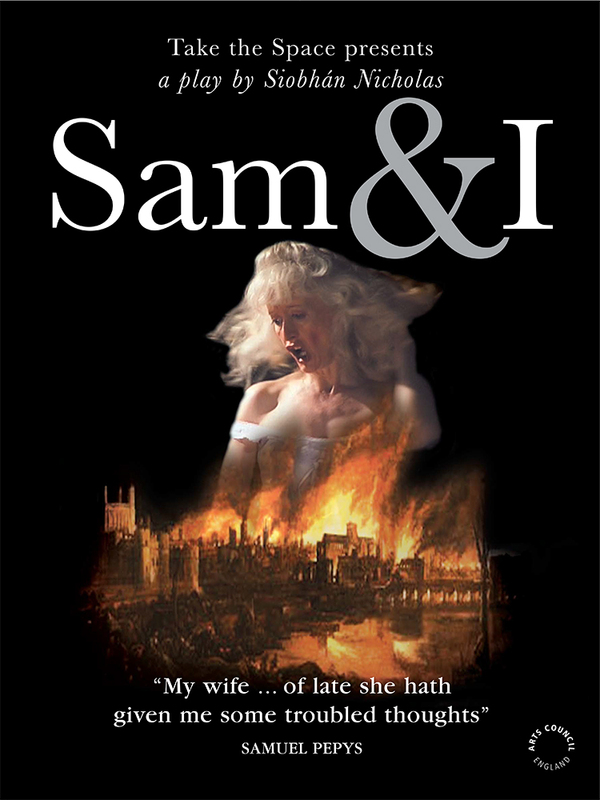 They both blame themselves, are tortured with grief and guilt, and the marriage pays the price when Grainne “disappears” in the middle of the act. Freddie (Chris Barnes) has lost everything – his wife, his son and his passion for his art. Taking advantage of a club circuit he degenerates into a sub-standard stand-up comedian to make a basic living – enough to keep him in beer and fags. He is redeemed when Grainne (Siobhan Nicholas) returns during his act – they re-run their old show and finally come to terms with their private agony. But take this at face value at your peril! The audience is made to work here, and we are challenged to question and explore everything. From the sleight of hand magic tricks and the “mentalism” (and I swear that no-one in the audience, including me, had a clue how this impressive deception was done) to Grainne’s appearance, evoked by the smell of a perfumed, long, black glove, Barnes and Nicholas make us think – how do they do it, is Grainne a figment of Freddie’s imagination or real, is she alive or dead, are they cursed or blessed, what does Freddie do next? It’s rare that the audience works (almost!) as hard as the performers, but this funny, poignant and classy piece of work gently encourages us to engage, to be involved rather than just spectators. Our efforts are rewarded by two stunning performances and by a sense of hope – no matter how bleak, how tortured we are, it’s possible to face our inner demons and overcome them, rediscovering ourselves in the process. Love and forgiveness heal and strengthen us – we share in Freddie’s emotion and tears. That said, we are also royally entertained by a beautifully crafted variety show and leave with a song in our hearts (Elvis or aria – take your pick)! This tiny company punches way above its weight – see them and experience meticulously researched theatre that stimulates, entertains and relies on skill and imagination. The narrative of this piece is peppered with illusions of a broad, circus/music hall nature, and is itself shifting and tricksy, so that you can’t be quite sure exactly what is happening. Some of the tricks involve the participation of members of the audience, Derren Brown-style (they are not stooges, I can assure you, as one of them was my daughter), and these are very cleverly done so that they a) astonish the audience in a how-did-they-DO-that! kind of way, and b) resonate brilliantly with the disclosure narrative. There is a constant tension between the ostensible purpose of the surface performance – a variety act designed to amuse and astonish an audience in a life-enhancing but fairly superficial way – and the underlying story of the man and his wife, which confronts the audience rather uncomfortably with terror, grief, rage and emotional breakdown; and the cultural context of the play, which evokes with uncritical nostalgia the lost arts of ‘journeymen and women: clowns, poets, actors, musicians, storytellers and magicians who throughout time have often lived on the fringes of society’ and who provided precious moments of joy to down-trodden working people in the olden days before telly. The programme notes (and title) tell us that we should be thinking of the films of Fellini and underdog scamps like Charlie Chaplin; of course we will also be bringing along memories of Archie Rice, emotional emptiness, spiritual drought. As you can see, this is a lot for a play to do that is less than an hour and a half long; but it succeeds triumphantly, because of the amazingly committed performances of Chris Barnes as Freddie Tourrino and Siobhan Nicholas (who wrote this and Take the Space’s previous play last year, Hanging Hooke) as his wife Grainne. Individually they are both remarkable; together, they are a tour de force that sweeps the audience in their wake as they strike, flare up and blaze from one another’s incandescent energy. Barnes as Freddie looks like a cross between Barquentine and the Ancient Mariner – his glittering eyes and wild hair convey a barely suppressed fury with his audience, placid and bovine and outside the circle of his personal hell (but not for long!). He has a simply wonderful nose - the nose Laurence Oliver spent his whole career trying to create out of putty (cf Olivier’s Nelson in That Hamilton Woman and his Duke of Wellington in Lady Caroline Lamb); but these external details are incidental to the actor’s emotional range and power – he seems almost to implode with grief before our eyes. Similarly, Siobhan Nicholas as Grainne exhibits the remains of a remarkable fey beauty with her huge cornflower-blue eyes and cascading hair that was once blonde and is now mostly white, but a beauty lit up from within by a spiritual furnace of love and grace with which she attempts to heal her husband’s bitterness and rage (but was she ever really there, or is he imagining it all from his prison cell?). Both performers are physically tiny but they absolutely fill up that stage (hence the company’s name I guess). Nicholas’s meticulous research shines through, for she hasn’t simply written a two-man play but put together a variety act. This is intermingled with scenes of the Tourrinos taking a painful look over their shoulders to the events leading up to the terrible tragedy that broke up their show. The contrast between these quieter, tensely emotional moments and the energy of those on either side make them all the more powerful. Chris Barnes as Freddie handles the shifts in his character with expert skill – moving from a battered performer at the end of his career to a broken-hearted father finally confronting the past. By the end he has real tears in his eyes. Nicholas plays Freddie’s wife Grainne, an almost ethereal woman who appears from the wings to take him on a journey to the past. There is real electricity between the two and it’s very easy to imagine Grainne’s head being turned by the young journeyman on their first meeting, told in a flashback sequence. Both moving and amusing, Dolce Via has everything a good variety act should – great stories, plenty of laughs and compelling characters. My fleeting appearance as magician's assistant was part of an act within an act, a magical tale of a life lived between worlds, of which alchemy dreams are made of. 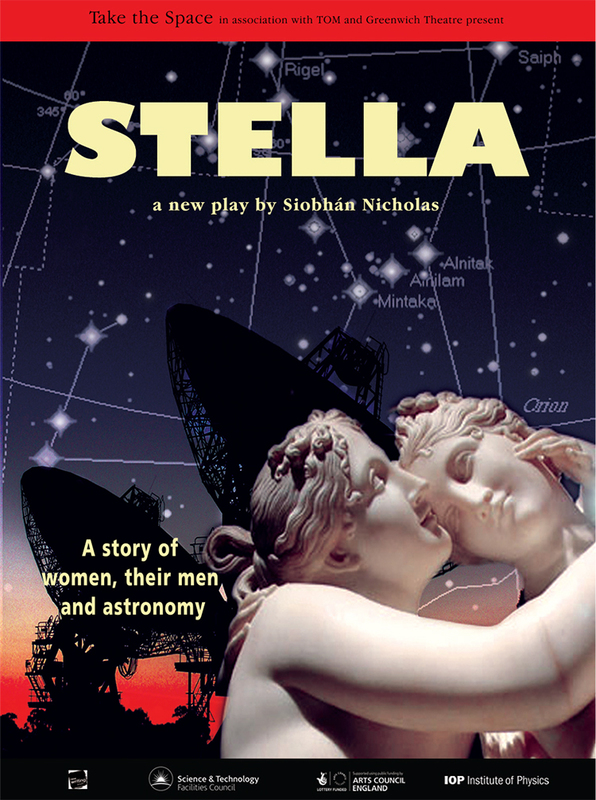 This new play by Siobhan Nicholas is presented by Take the Space, in association with Guildford's Yvonne Arnaud Theatre. Siobhan herself plays Grainne, alongside Chris Barnes, who plays Freddie. Storytelling, song, magic and mindreading unite their past and present, as the two Vaudevillians present the show of their lives. Their way of life, their comedy, their tragedy, and the 'olio of oddities' at the heart of their stageshow. Together they relive the romance of roads travelled together, the smell of the greasepaint, the thrill of chasing fame and fortune. 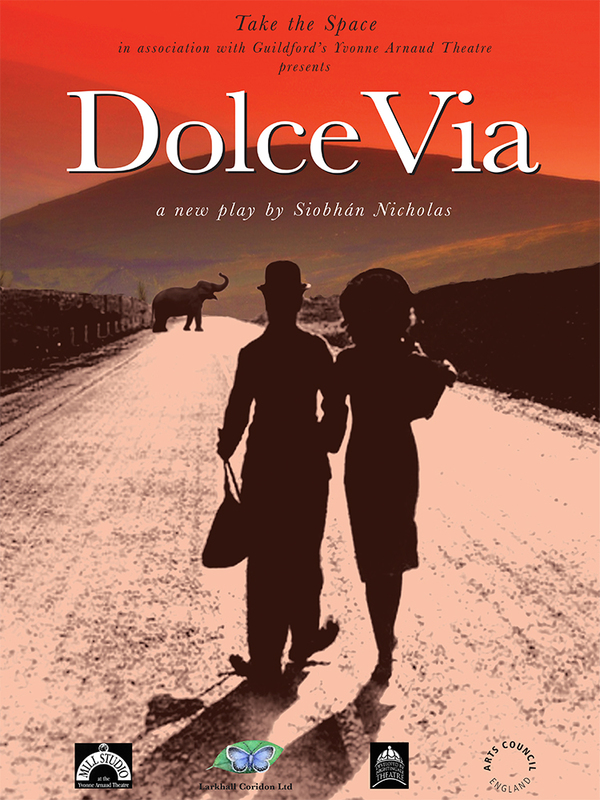 But Dolce Via is far more than a trip down memory lane, pulling a few rabbits out of a battered old hat on the way. It is a poignant and compelling story of love, loss and forgiveness, played out by two engaging performers who give their all throughout. This poetic play is dedicated to 'all journeymen and women: clowns, poets, actors, musicians, storytellers and magicians who throughout time have often lived on the fringes of society,' and every step of the journey is a hard act to follow.